Amazing video from the System Club archive. Lesson #1: Invest in Facebook when it’s just some kids coding in a rented house in Palo Alto. But it you can’t do that, then what? Listen to what Zuckerberg is saying. Understand his evolution. Fortunes like his are unpredictable. No one, least of all him, saw it coming. But what is predictable is that correct focus leads to good results. Giving the customers he understood intimately (in his case college students) the best possible user/customer experience. Not taking over the world…not making billions of dollars…not being the Silicon Valley wunderkind. It’s so simple – and so easy to lose sight of. P.S. One of the smartest and most successful businessmen I’ve ever had the opportunity to meet – Greg Renker of the infomercial giant Gunthy-Renker – said something at Brian Kurtz’s recent Titans of Direct Response event that stopped me in my tracks. I’ve always felt that was true and it was great to hear it coming from the stage from someone with Greg’s level of accomplishments. It’s all about the fundamentals. 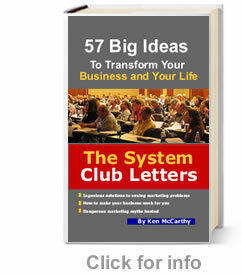 At the System Club, we’re unique in that we don’t chase the latest market fads. We drill and drill and drill some more on the fundamentals. The success of our members shows we’re on the right track.